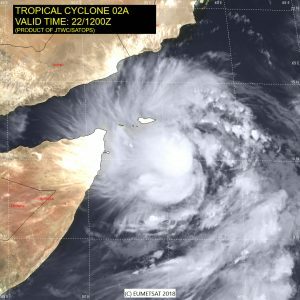 Tropical Cyclone 02A has formed over the Arabian Sea about 610 nm soth of Masirah Island and was moving towards the NNW at about 7 knots. Max winds were 35 knots, however, conditions favor deepening and is forecast to reach hurricane intensity in 24-36 hours. The forecast track takes the center inland over Salaha, Oman on the 26th around 0600 UTC. This entry was posted in Ocean Storms, Tropical Cyclones and tagged Arabian Sea, Ocean Weather. Bookmark the permalink.